Samsung Galaxy S10 and Samsung Galaxy S10+ (aka Samsung Galaxy S10 Pro) prototypes have leaked online in photos that show the two phones from various angles, leaving very little to the imagination. The Samsung Galaxy S10+ is tipped to be the most premium variant of the lot, and it is seen sporting two front cameras and three rear cameras. Both the variants support a 3.5mm audio jack, USB Type-C port, and a speaker grille as well. The Samsung Galaxy S10 is seen to sport only one front camera. 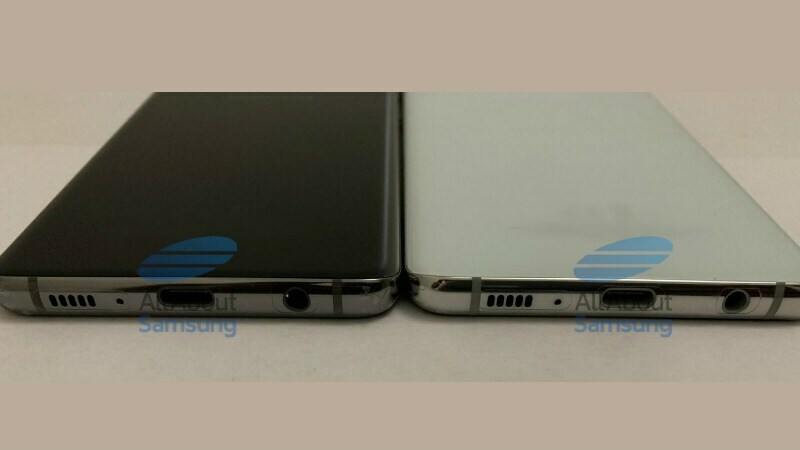 AllAboutSamsung has published several photos of the two variants from different angles. Starting with the front, the Samsung Galaxy S10 is seen sporting a single front camera, whereas the premium variant is seen sporting a dual front camera setup. Both the phones sport an Infinity-O Display design, and the Samsung Galaxy S10+ variant is visibly bigger than the vanilla variant. There are also slight chins seen at the bottom edge of the panel of both the phones. Coming to the rear panel, both the phones sport a horizontal triple camera setup, with the flash sitting at the last on the right. There’s no fingerprint scanner in sight, which means both variant will come with in-screen fingerprint sensors. The bottom edge of the phones has also been leaked in the photos, and we can see the 3.5mm audio jack, the USB Type-C port, the microphone and the speaker grille. These photos leave very little to the imagination of what the final Samsung Galaxy S10 and Samsung Galaxy S10+ variants could look like. However, we recommend you to take all the leaks with a pinch of salt until the official unveil expected to February 20. The Samsung Galaxy S10 series is set to have a Lite variant as well, which is expected to sport a 5.8-inch display, and a side-mounted fingerprint scanner. Facebook Comments Get Reactions, But Do They Improve Or Kill Communication?